This PDF 1.4 document has been generated by Writer / OpenOffice.org 3.3, and has been sent on pdf-archive.com on 11/02/2018 at 17:03, from IP address 68.50.x.x. The current document download page has been viewed 207 times. File size: 346 KB (6 pages). irrotational) vector field and a transverse (solenoidal, curling, rotational, non-diverging) vector field. or the relaxed part and is contained in the other parts. Start with a general vector field F(x) where x is the three-dimensional observation point vector. the curl of F we will call the source of F's curling nature. It is a vector field U. 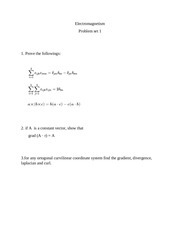 Both ψ and U are source fields; they are not the vector field components of F but are related to them. Let us go back to the expansion of F and see if we can get them to appear. respect to the primed variables. expansion can be used to derive Coulomb's law and the Biot-Savart law. 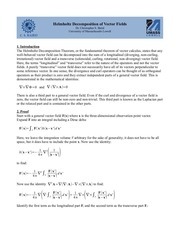 of boundary conditions (this is the Uniqueness Theorem). plots, only the vector field's directionality is shown and not its magnitude. (a) The field F=−y ̂i+x ̂j is plotted on the right. This is a transverse (curling) field. (b) The field F=x ̂i+ y ̂j is plotted on the right. This is a longitudinal (diverging) field. (c) The field F=x ̂i− y ̂j is plotted on the right. This is a purely Laplacian field. (d) The field F=( x− y) ̂i+( x+ y) ̂j is plotted on the right. This is a transverse and longitudinal field. (e) The field F=4 ̂i+2 ̂j is plotted on the right. (f) The field F=( x+ y) ̂i+( x+ y) ̂j is plotted on the right. symmetric source rather than a radially symmetric source. 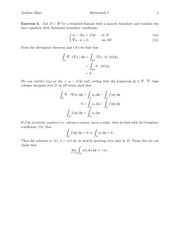 Laplacian when f = 0. This is the reason for the appearance of “ Φ=undefined ” above. This file has been shared by a user of PDF Archive. Document ID: 00732927.